In order to avoid birth of children with debilitating genetic disorders, such as Thalassemia, UAE nationals are encouraged to get tested before marriage to find out if they are carriers of the Thalassemia gene or other genetic disorders. For couples already married, who are carriers of such genes and expecting a baby, they now have an opportunity to find out if the foetus will develop into a thalassaemic child or not. According to an health official, each year an average of 70 expecting UAE couples are flown abroad on the government's expense to get pre-natal tests done that can determine if their foetus is thalassaemic or not before the third month of pregnancy. If the foetus is thalassaemic, the parents have the choice to abort the pregnancy if they wish. The tests are 99.5 per cent accurate. Fatwas from the holy city of Makkah, the Al Azhar University in Egypt and from Iran, have permitted the abortion of foetuses before the first trimester is reached in cases where the foetus would be born with a debilitating genetic disease that will cause life-long suffering. Dr M. Naveed, Clinical Geneticist at the Al Wasl Hospital's Genetic Research and Thalassaemia Centre and a lecturer at the Dubai Medical College, made a presentation yesterday on the Dubai experience in pre-natal diagnosis and on prevelent genetic disorders in the region, at a medical workshop on genetic disorders in the Arab world held at the Shangri-la Hotel. Speaking to Khaleej Times, Dr Naveed said: "The carriers of the Beta-Thalassaemia gene among the local population has reached 49 per cent. Thalassaemia is also common among the expatriate population, with prevalence rates among the South East Asian community reaching 8.3 per cent. "If two carriers of the gene marry, there is a 25 per cent chance that the child will be born with thalassaemia, a 50 per cent chance that the child will be born a carrier like his parents and a 25 per cent chance that the child will be completely normal." He said that genetic diseases are not easy to manage and treat but they can be prevented. Awareness makes a big difference. 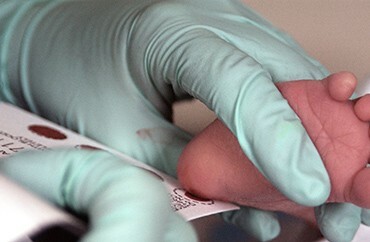 In Sardinia on the Mediterranean, where thalassaemia was rampant at one point, there has not been a single child born with thalassaemia in the past 15 years due to increased awareness among the population on the dangers of consanguineous marriages, identification of carriers through compulsory blood tests and pre-natal testing. Dr Naveed said that pre-natal tests are essential to set the parents' mind at ease, adding that a child born to two carrier parents still has a 75 per cent chance of being born without thalassaemia. Couples who are both carriers can go for artificial insemination as a guaranteed method to have a non-thalassaemic child. An egg is taken from the female and fertilized by the male sperm. Then when the embryo divides into eight cells one of the cells is extracted and tested. Healthy embryos are then implanted into the female or stored for the couple until such a time as they wish to have a child. "The first pre-implantation genetic diagnosis was recently carried out for a patient at the Genetic Research and Thalassaemia Centre at Al Wasl Hospital and the embryo was successfully implanted. The patient has given birth to a healthy baby one month ago," Dr Naveed said. He said that the goal of the Centre for Arab Genomic Studies, an initiative of the Shaikh Hamdan bin Rashid Al Maktoum Award for Medical Sciences, which is expected to be up and running by the end of next year, is to collect data on genetic diseases to identify other rampant genetic disorders in the Arab countries with the aim of preventing these debilitating disorders. The Emirates Thalassemia Society, made up of the parents of thalassaemic children, has done a lot to increase awareness about this disease by introducing it as a subject in school curricula, by getting the UAE Marriage Fund to make pre-marital blood tests compulsory and by spreading awareness in the community. Dr Naveed said that it is time other genetic diseases in the A rab region are tackled with equal zeal. Professor Ahmad Teebi, Professor of Paediatrics and Medical Genetics at the University of Toronto and Head of the Clinical Genetics and Dysmorphology Section, addressed the workshop yesterday delivering a lecture titled: Patterns of inherited diseases among Arabs. He started by tracing the various migrations to and from the Arabian Peninsula, the first of which was around 3,500BC, the second at 2,500BC, the third during the emergence and expansion of Islam, the fourth during the Crusades, when Europeans mixed with the indigenous inhabitants. The last of these migrations was in the 19th and 20th centuries with the increase in international trade, making the Arab population ethnically diverse. Prof Al Teebi said that in the Arab countries there is a high level of consanguineous marriages, reaching 90 per cent in some isolated communities in Saudi Arabia. "The average Arab family size is six members and an extended family pattern is widely prevalent. There is usually a multi-generational practice of consanguinity and we see an increased frequency of autosomal recessive disorders," Prof Al Teebi said.